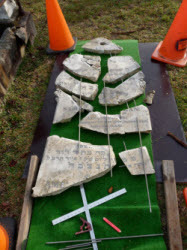 The Jewish Cemetery Trust of Rookwood Necropolis in concert with the National Trust of NSW has embarked on a major conservation programme in the section of the cemetery known as the Old Ground. 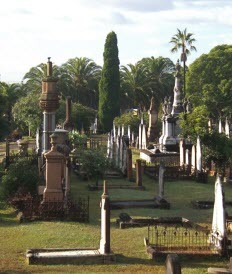 This was part of the original 200 acres of the whole of Rookwood cemetery, acknowledged for its unique historical significance by inclusion in the NSW State Heritage Inventory. All work performed in this area must be approved by the Heritage Council of the NSW Office of Environment and Planning and be executed by monumental masons with technical experience in conservation maintenance for sandstone, marble, and the mortar, metal pins and other materials used in the past. During 2009 and 2010 the Jewish Cemetery Trust commissioned conservation work for 70 monuments. In 2011 we have commenced work on another 109. Following these the Trust will continue the conservation project for another few hundred monuments. 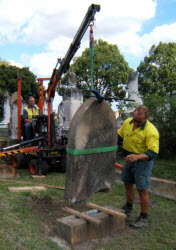 The work includes restoration of broken headstones, returning to vertical the leaning and fallen headstones, repair of kerbing, rebuilding the separated parts of box style monuments, reduction of surface mold and fungi, and restraining the effects of salts which have leached from the ground. The Trust, as the caretaker of the cemetery on behalf of the Jewish community, would appreciate financial assistance for this project. Tax deductable donations can be made to our account held in partnership with the National Trust by contacting our office. As an indication, the cost of work for individual monuments ranges from $200 to $1,500 with an average of $600. Please note that the Jewish Cemetery Trust is not a recipient of JCA or other grants. The list of the names of the monuments selected for work can be downloaded here. Please contact our office if an ancestral monument in the Old Ground requires maintenance and is not on this list of work contracted between 2009 to 2011. Since European settlement began in Australia over 80% of all Jewish burials in NSW have been at Rookwood. Between the consecration of the cemetery in 1867 and the start of World War II, while 4,500 Jewish burials were conducted at Rookwood, fewer than 100 in Sydney were in other cemeteries. The Jewish Old Ground also has 105 tombs transferred from the previous public cemetery which had been cleared to build Central Railway in 1901. Their burials date from 1837 with birth dates from 1763. Our cemetery at Rookwood is, without question, one of the most significant historical sites of our Jewish community. It is an almost two century memorial without discrimination for class or religiosity. It is a record of the convicts, the shopkeepers, the rabbis and the high court judges, and the children; with no differentiation among those who were or who were not members of Synagogues or other organisations. At Rookwood we can pay homage to our predecessors, and we can appreciate their own families’ affection for their departed relatives by their choice of monuments and inscriptions.